Ticks can pose a health hazard to you and your pets. In Pennsylvania, the two most common ticks are the deer tick, Ixodes scapularis, and the American dog tick, dermacentor variabilis. Homes built near wooded areas have an increased potential for contact with wildlife and their ticks. You can reduce the number of ticks near your home by making landscape changes and the selective application of least-toxic insecticides. Landscape changes you can make to create a safer tick zone include keeping your lawn mowed, clear leaf litter and brush especially along edges of lawn and moving play sets away from the woods' edge. Brooks & Barber Tree Management can design a tick management program for your property. Apply an insecticide spray to the plants and foliage on the edges of woodlands, the areas of turf grass just beyond the woods edge, the ground cover beds on the property and any other areas on the property to control emerging tick nymphs. Apply a second tick treatment to control the emerging nymphs and adult ticks. Apply a third tick treatment to the affected areas of the property for the control of emerging ticks. Apply a tick treatment to the property as needed. Apply a tick control treatment as needed. Apply a tick treatment to control the adult tick populations. 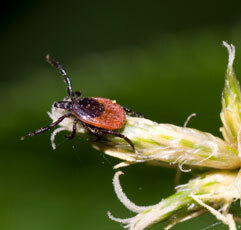 Apply the final seasonal tick treatment to the property as needed. Place tick tubes or other devices in firewood piles, leaf compost areas or other locations in the landscape to provide insecticide treated material as bedding to tick host such as mice and other rodents. This can help reduce the over-wintering populations of ticks in the fur of mice and other rodents.